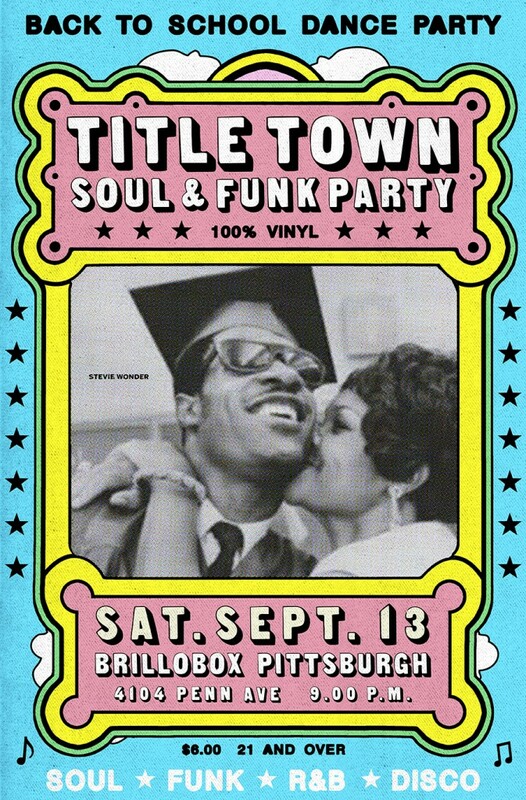 TITLE TOWN Soul & Funk Party 5 YEAR ANNIVERSARY PARTY Saturday, October 11th BRILLOBOX (4104 Penn Avenue, Pittsburgh) 8pm – 2am; $7; 21+ ($5 before 9pm) Facebook RSVP Early evening support starting at 8pm: DJ Jordan K & DJ Derek White. Residents: J.Malls & Gordy G. FREE T-SHIRTS , GIVEAWAYS, AND MORE STARTING AT 8 P.M. EARLY ARRIVAL IS RECOMMENDED. It’s hard to believe, but it’s been FIVE YEARS already. 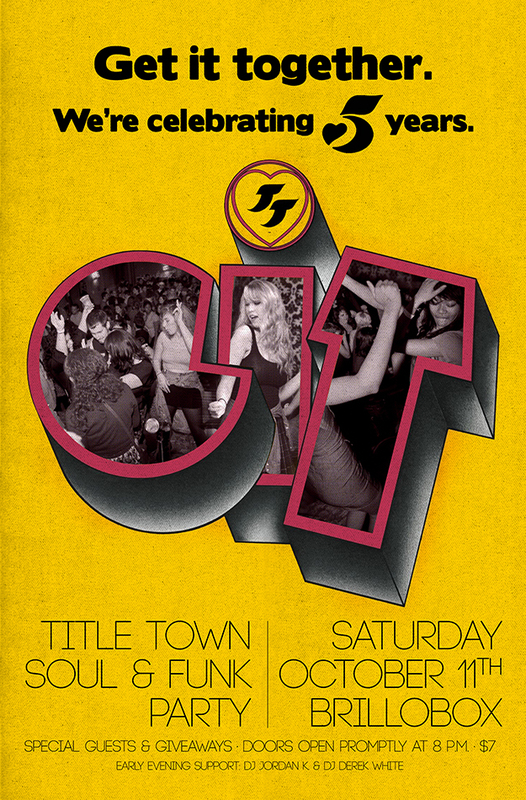 TITLE TOWN Soul & Funk Party invites you to celebrate with us on Saturday, October 11th at the brillobox beginning at 8pm. Since October 2009, TITLE TOWN has been hosting its monthly soul and funk get down at various locations around Pittsburgh - and beyond. 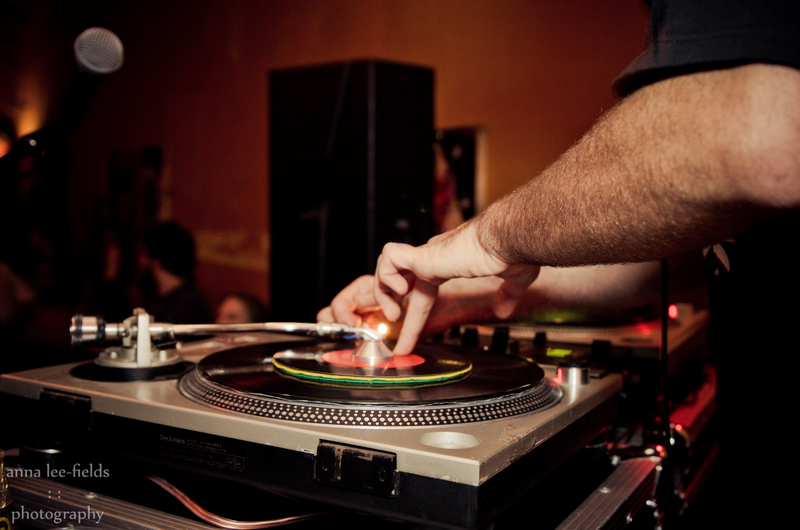 Voted one of the best dance parties of 2010 and 2013 by Pittsburgh City Paper readers, TITLE TOWN has secured itself as a staple of Pittsburgh's club scene and a hedonistic throwback to the days of legendary clubs and long-lost nightspots of the past. And the mission has always remained the same - pay tribute to the lost and forgotten soul sounds from the artists and regional scenes of the ‘50s, ‘60s, and ‘70s. It’s an intimate dance party, driven by the warmth, spontaneity and grit, of the 45 r.p.m. record - and it’s a night of music that doesn't sound like anything else. So we press on, we work the decks and the dance floor late into the night, spinning rare and classic Soul, righteously funky grooves mixed with a hefty dose of Motown, Disco, old-school Rhythm & Blues, Latin Boogaloo, and more of the goodness that keeps you coming back. Most importantly, we couldn't have done it without your support. 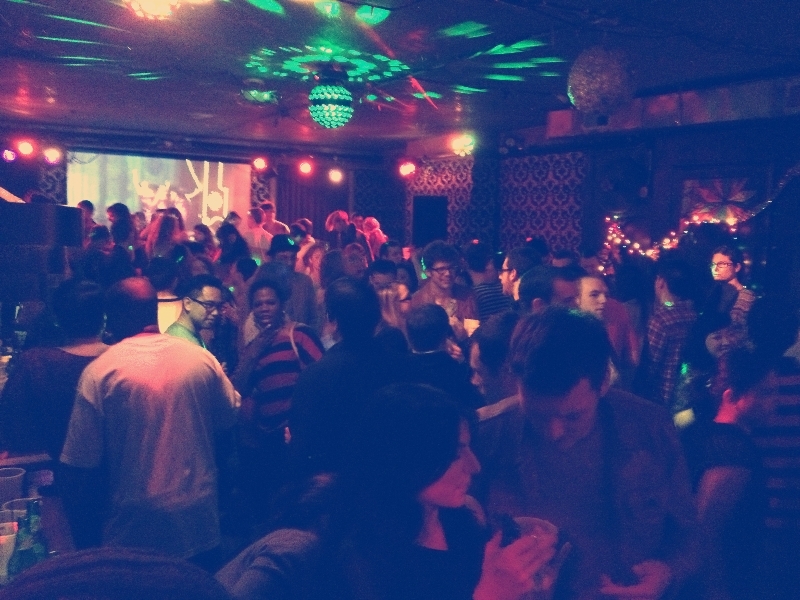 A huge thanks goes out to the everyone at the Shadow Lounge and the Brillobox, the bartenders, the guest DJs...and of course...you. See you on the dance floor! RSVP on Facebook.